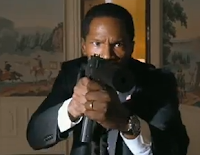 2013 has experienced several White-House-in-calamity movies, the first being the extremely disappointing Olympus Has Fallen. And now White House Down succeeds it as very easily the better movie of the two. It still remains the case, however, that both flicks fail to make the grade. Being at some places reminiscent of the first Diehard movie (minus the humor or the wit or the credibility), the film opens with Capital Police officer and aspiring Secret Service agent “John Cale” (Channing Tatum) in the “dog house” with his ex-wife “Melanie” (Rachelle Lefevre) and their 11-year-old daughter “Emily” (Joey King) who happens to be a big fan of politics in general and “President James Sawyer” (Jamie Foxx) in particular. When Emily learns that dad scored tickets for a White House tour, all past wrongs are forgiven and forgotten. What starts out as an ordinary tour becomes a takeover from the inside out. With the nation’s line of leadership cut and the struggle to re-establish the chain of command in the works – with two acting presidents put into power successively (Michael Murphy, Richard Jenkins) – the president and Cale remain trapped together inside a besieged White House with well-trained paramilitary invaders led by an especially decorated soldier-turned-dissident “Stenz” (Jason Clarke). When they are eventually able to get the message out about their status, things seem to still be getting worse as Sawyer and Cale’s odds of remaining uncaught begin to dwindle. Making matters much worse, control of the nation’s nuclear weapons soon becomes the central issue. Unlike Olympus Has Fallen, which failed on just about every level, White House Down boasts lots of good action, great fight sequences, smooth pacing, and a keen re-creation of the White House and its many corridors and rooms. The movie begins to develop in us that needed sense of anticipation necessary to better enjoy the viewing experience—that is, until we consider how it still somehow managed to mess things up. Director Roland “The Day After Tomorrow,” “2012” Emmerich and writer James “The Amazing Spider-man,” “The Losers” Vanderbilt are certainly not amateurs in their craft, but both demonstrate that they have no little to no idea on how to write comedy (or at least comedy relief as it was attempted here). 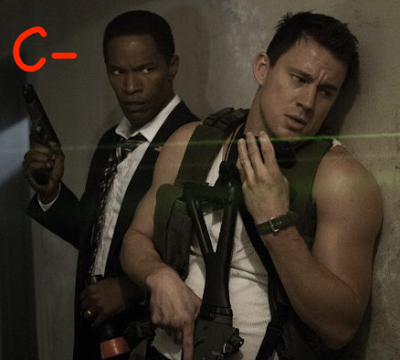 The often unworkable and awkward dynamic between Tatum and Foxx is one of such unfunny jokes and lame one-liners that when they gab back and forth, they sound like geeky kids trying to be funny in a middle-school cafeteria. Tatum’s lack of acute versatility doesn’t hold him back here with him doing about as well as a now rather seasoned Maggie Gyllenhaal as “Special Agent Finnerty,” who, unlike many characters, has us getting an idea of who she is. It is more than worth mentioning that the commendably high level of Diehard-esque violence and raw excitement make this a viable crowd-pleaser, but the script loses an increasing amount of credibility the more it tries to get us to take it seriously when anything other than action is on the screen. The interactions of nearly everyone fails or at least struggles with their verbal exchanges tending to consist of clichés and/or bad attempts at humor. The movie is slightly less dramatic than the trailer lets on. A little more maturity and a lot less trying to please every member of the audience with silliness and various improbabilities would have honed this already stimulating film into something really worth it.